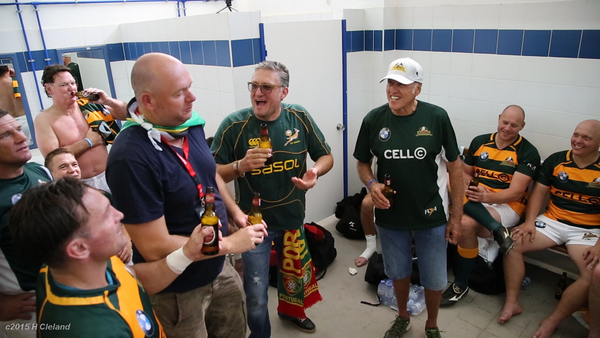 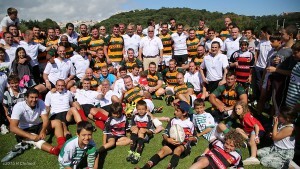 A star-studded line up of SA Rugby legends travelled to Portugal at the invitation of the South African community and the Portuguese rugby fraternity, spearheaded by a South African based in Lisbon, Tim Viera. 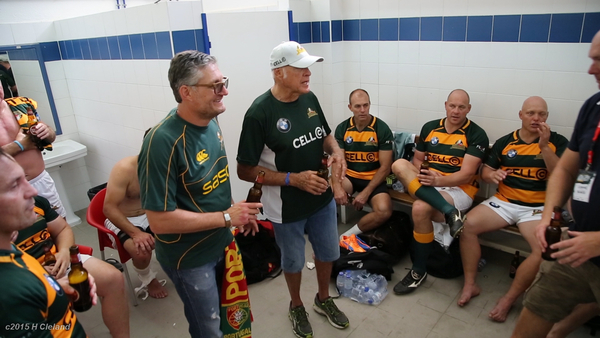 The SA legends included Percy Montgomery, Butch James, Lawrence Sephaka, Marco Wentzel, Thinus Delport, Rudi Keil, Charl Van Rensburg, De Wet Barry, Brent Russell, Neil Cole, Marc Watson, Deleray Du Preez, Pieter Dixon, Hottie Louw, Bian Vermaak, Corne Steenkamp, David von Hoesslin, Henno Mentz, Wilie Wepenaar, Andries Human, Cobus Grobebelaar and Dean Martin. 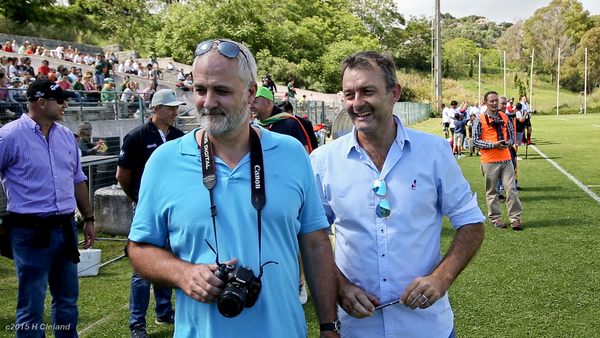 Accompanying them as team managers, alongside coach Ian McIntosh, were 2 former Springbok captains – Gary Teichmann and John Smit, as well as 1995 Rugby World cup winner Mark Andrews and World Rugby Hall of Fame inductee and arguably SA’s greatest centre Danie Gerber. 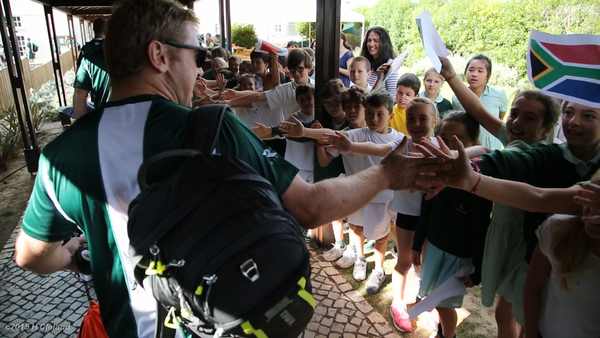 The tour took them to the capital city of Lisbon and the popular seaside resort town of Cascais. 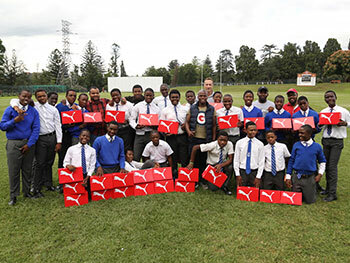 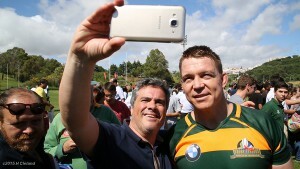 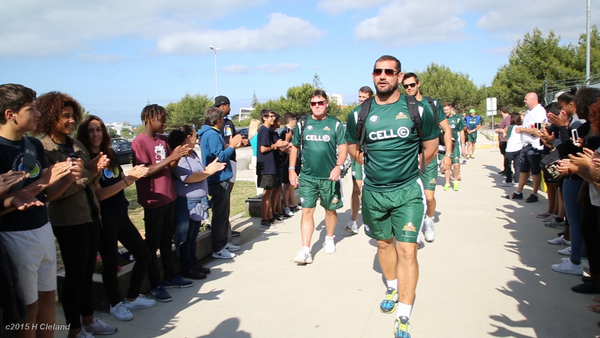 The legends spent time meeting young rugby players at a rugby clinic as well as meeting members of the SA community based there and Portuguese rugby fans, and being provided with wonderful hospitality by their hosts. 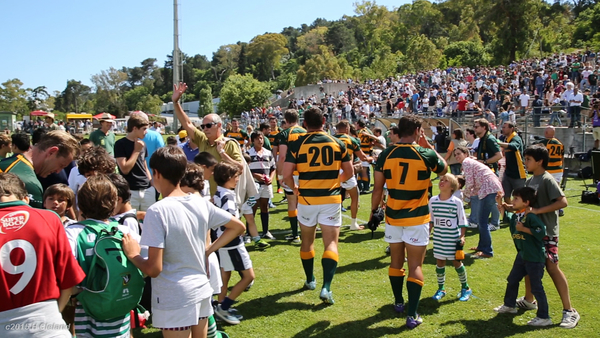 The highlight, as always was the rugby match which they played against the Portugal Rugby Greats (Os Lobos) on Saturday June 4 at the Estádio Nacional do Jamor in Lisbon. 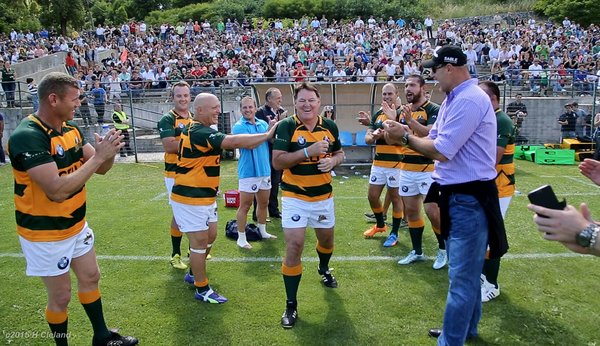 The match saw a crowd of over 3000 come out to see the legends in action. The match saw a crowd of over 3000 come out to see the legends in action. Os Lobos fielded many of the players who featured in Portugal’s national side from the 2007 Rugby World Cup. 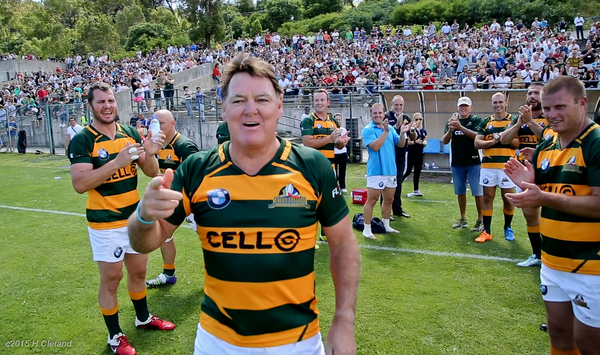 The SA Legends team included 3 members of the 2007 Springbok side that went on to win the RWC that year – John Smit, Percy Montgomery and Butch James. John couldn’t resist donning a jersey to get a run on the park again. 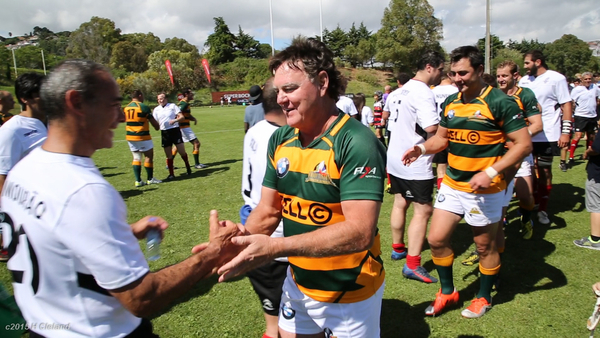 The Portuguese team started very strong and thwarted a few attacks in the opening 15 mins with a number of try scoring opportunities by the SA legends being missed due to great defence from the home side. 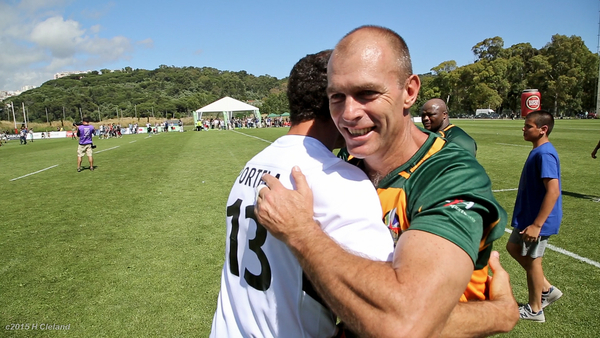 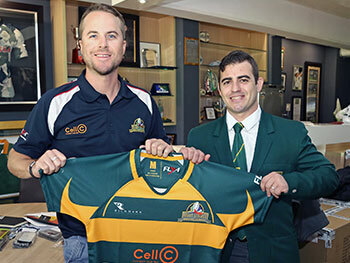 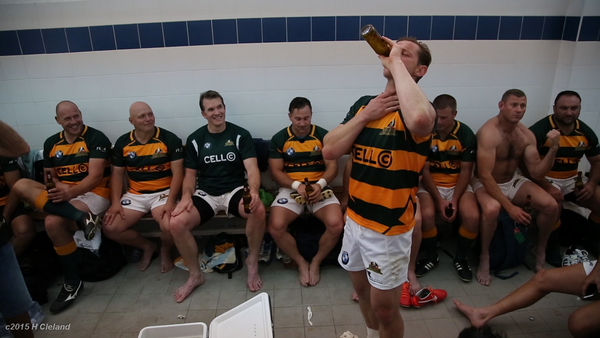 Eventually the game opened up with some great play for the SA Legends scoring 12 tries and 7 successful conversions. 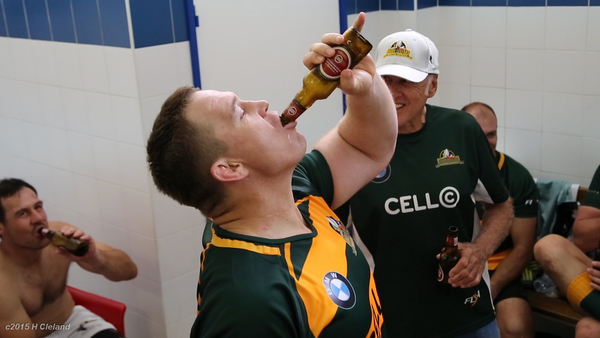 Man of the match, Rudi Keil, was instrumental in steering the South Africans to victory. 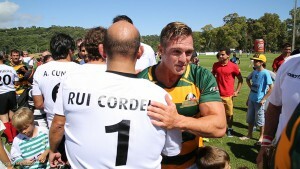 He was impressive in his first game for the Legends, scoring 2 of the tries, and converting one of them. 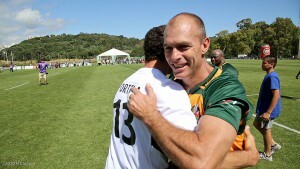 Man of the match, Rudi Keil, was instrumental in steering the South Africans to victory. 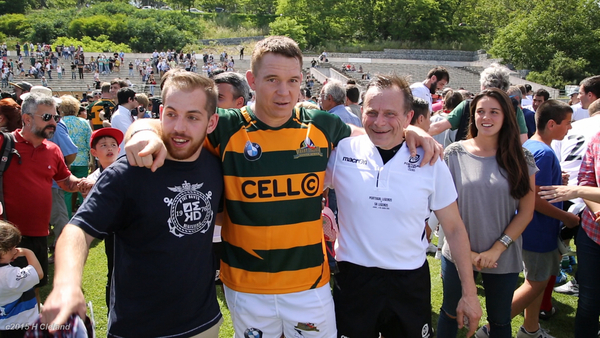 Tries were also scored by Henno Mentz (who always manages to cross the line when playing for us), Percy Montgomery, Charl van Rensburg, Corne Steenkamp, Marco Wentzel, Reinhard Gerber Neil Cole and Dave von Hoessein. 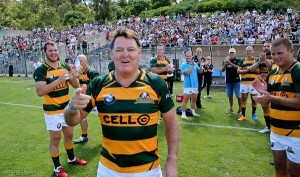 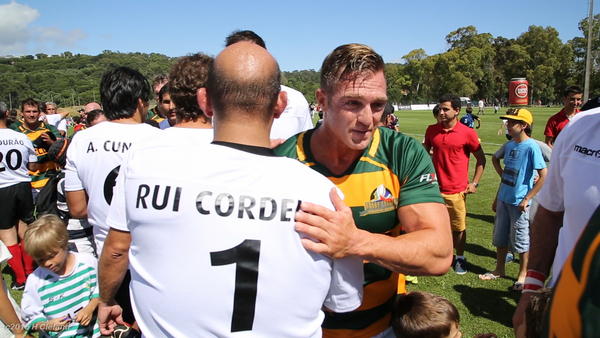 With 7 minutes to go, World Rugby hall of fame Danie Gerber came on to a great reception and scored the last try of the game. Successful conversions for 7 of the tries were made by Butch James (2), Reinhard Gerber (2) and one a piece to Brent Russell, Rudi Keil and Dave von Hoesslin. 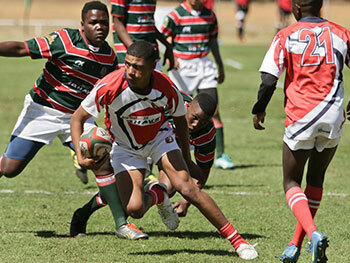 Os Lobos scored two tries and one conversion. A wonderful day out on the park, a great day for rugby and a most appreciative crowd. 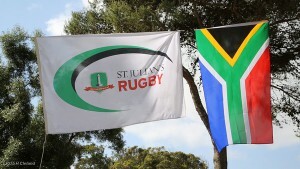 A big thank you to the organisers for the incredible organisation and hospitality.